This is a set of three acrylic risers. These risers are perfect for displaying items in a unique way. The flame polished edges create a clean and professional finish. The varrying sizes allow for dynamic in your display setup. These acrylic risers are highly durable and will make your product look the best it can. The simple design does not distract and blends well into pre-existing decor. These attractive acrylic tables are perfectly sized to display larger products or several smaller ones. 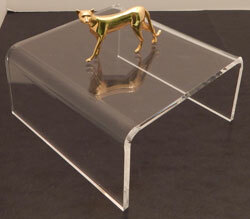 Tables are constructed of clear acrylic, suitable for any retail decor. These acrylic display risers are made of 1/8" thick clear acrylic. There are 7 different sizes of acrylic risers in this set. They are three sided and open on the front and back sides so that smaller acrylic risers can fit inside the larger ones if you wish. Features: standard clear acrylic display risers - 1/8" thick clear acrylic construction. - 7 sizes of acrylic risers to choose from. - Square Available sizes for square acrylic display risers: 2"w 2"d 2"h 3"w 3"d 3"h 4"w 4"d 4"h 5"w 5"d 5"h 6"w 6"d 6"h 7"w 7"d 7"h 8"w 8"d 8"h Set of 7 The price for each type of acrylic display riser will appear once you choose your size.